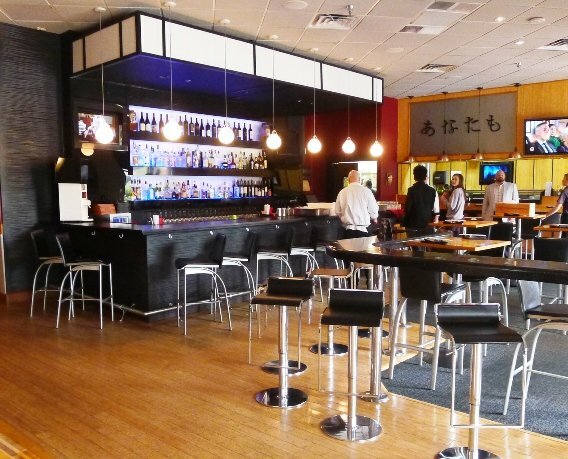 We stopped in at about 6:30 and the group was just starting to gather in Mura’s lounge and bar area. 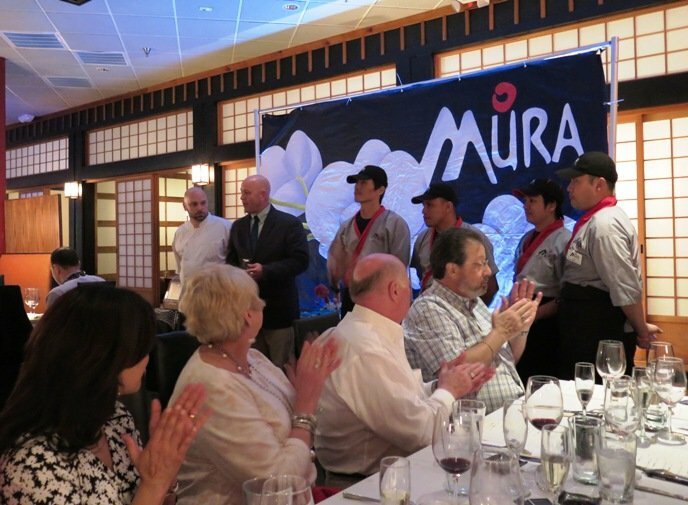 At a bit before 7pm, 30+ lucky diners get escorted to Mura’s back dining room for this very special meal. At each place setting is a menu on a long card for the evening. We will get to choose our favorite beverage out of each pairing for the evening, all provided by Mutual Distributing. And even though we won’t get a wine-sake pairing for each of the nine courses, we will get them for six which means 12 pours in total, whoa! Sara Guterbock, a sake sommelier from Mutual Distributing Company opens up the dinner with some fluent Japanese and tells us about the pairing process for the meal. She suggests trying the wine or sake first solo and the after you’ve tried the dish which will give it a very different flavor profile. We will also have the option to purchase any of the wines or sakes sampled tonight, wholesale at the end of the evening! Winner, winner, wine and sake dinner! 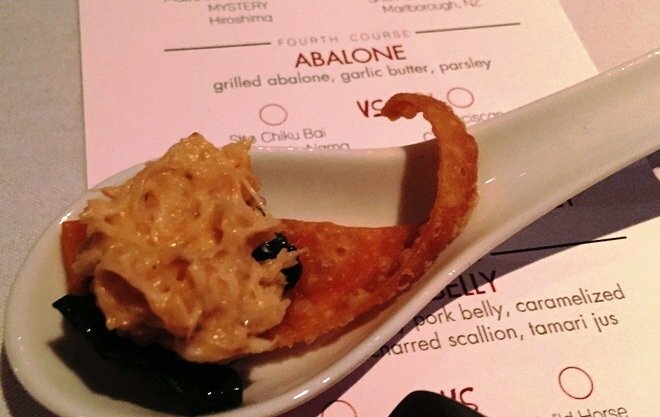 We open up the meal with a crab crisp: warm melty crab piled on a crunchy wonton strip, very nice start. 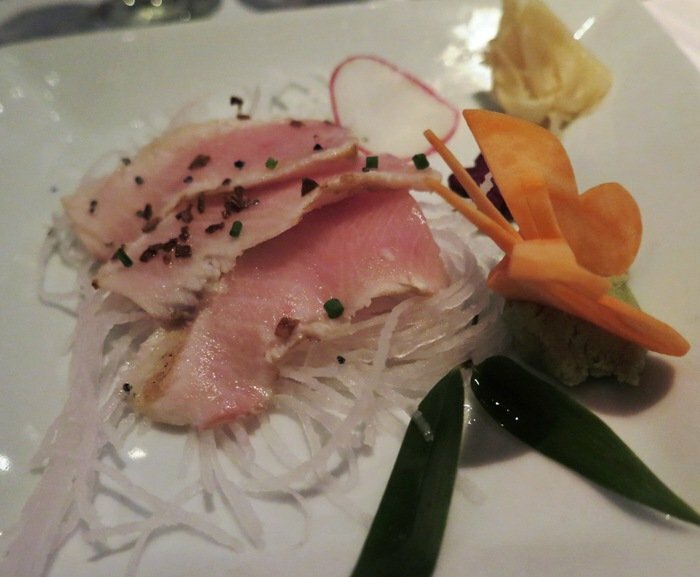 Hiramasa tataki is next, three slices of amberjack tuna lightly seared. 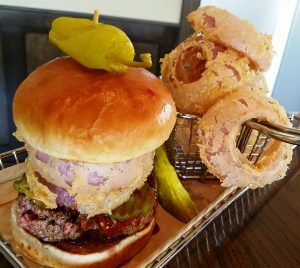 It’s served with garlic chips and black salt which makes for a mouth-meltingly bite! A carrot butterfly sits on the plate overlooking the dish, excellent presentation. Paired with a Mondavi fume blanc and some clean sake works well for this plate. 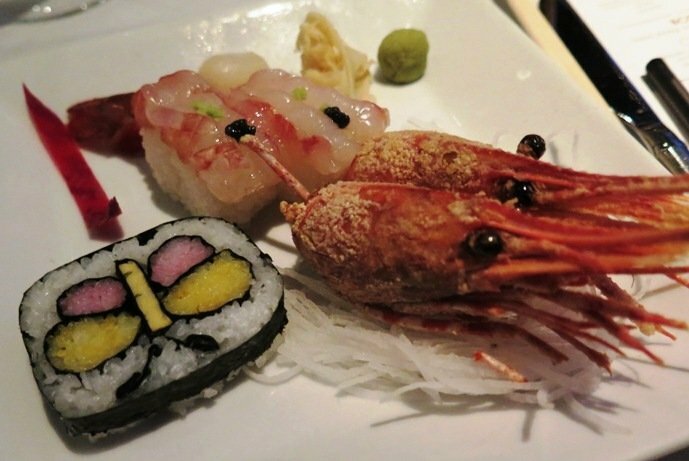 Next up is a beautiful botan shrimp nigiri with caviar presented with the flash-fried head of the prawn. On the side, came a sushi slice (mostly rice) designed with a butterfly. Each diner had a slightly different sushi slice with a different creature on it, great creativity. The shrimp nigiri was plump and had great texture to each bite. I was really impressed by the work that went into this plate from a presentation standpoint. Course four is grilled abalone with garlic butter, three slices of chewiness presented on the back of a shell. 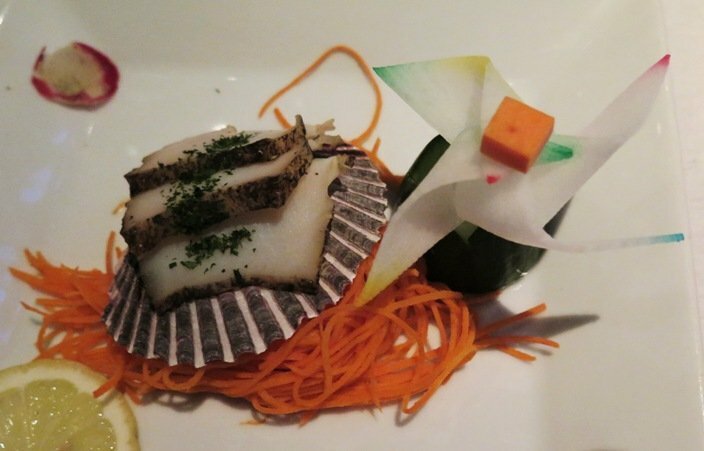 It all had the look of an artistic snail and while the sliced abalone was not a diner favorite at the table, again it was a fun presentation and plated beautifully. The abalone was more about texture than taste which was fine by me! 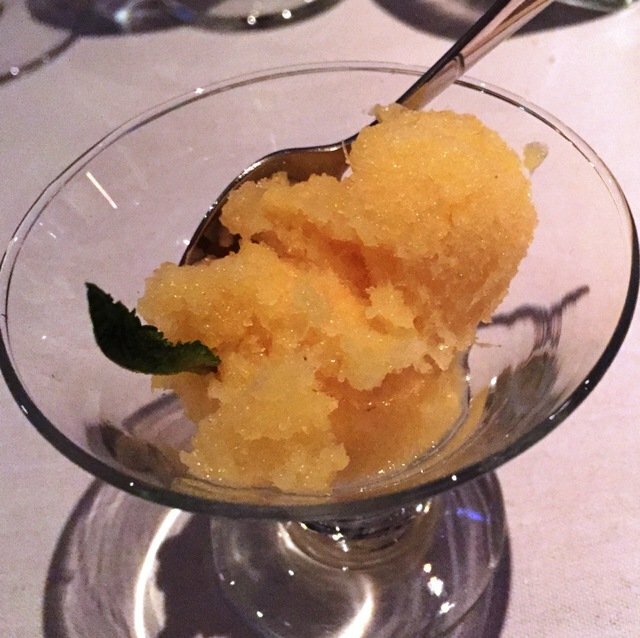 We’re finally at the mid-point of the meal and served a palate cleanser: pineapple sorbet. 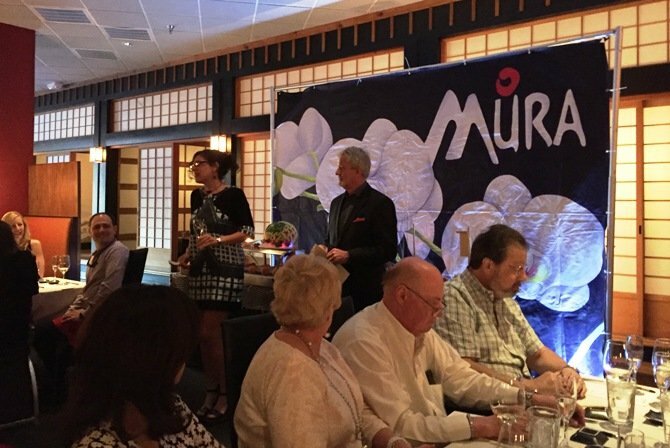 As the wine and sake has flowed, the volume and noise in Mura’s dining room has gone up four times and of course the lucky guests are getting a little boisterous! We’re introduced to the Mura chefs and Eschelon restaurant group’s leader is in the house, G. Patel. I see the man everywhere and of course it’s always good to catch up with him. 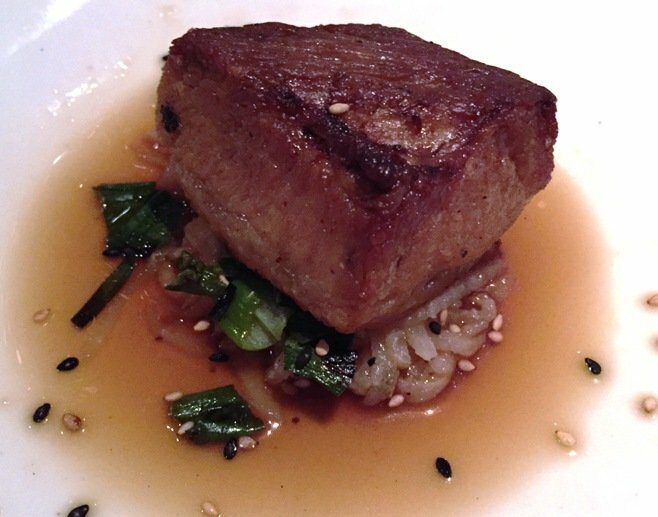 Course six for this grand meal shows up and it’s a sake-braised pork belly with Asian pear and scallions. I love the color and depth of the broth it’s served in, looks great. My friend Gina loves it but it’s not my favorite! The sear leaves a pretty chewy surface on top but it’s still tasty. 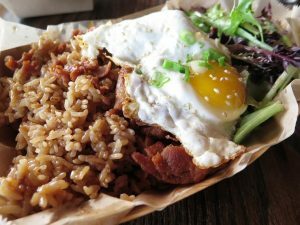 Come on now we’re talking pork belly. The wines have moved into the reds now, we’re doing a solid pinot noir with our first meat course. Overall I’ve found the sakes to be very consistently decent and more neutral which makes for an easier pairing. However with the correctly paired wine, the plate and food definitely pops a bit more. Course seven is toro tartar served on crispy taro chips. 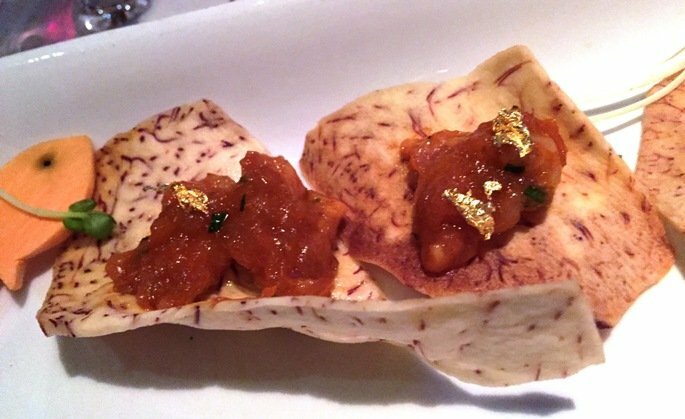 It’s a simple but amazing looking dish with lots of deep colors set off by the flash of gold, beautiful stuff. 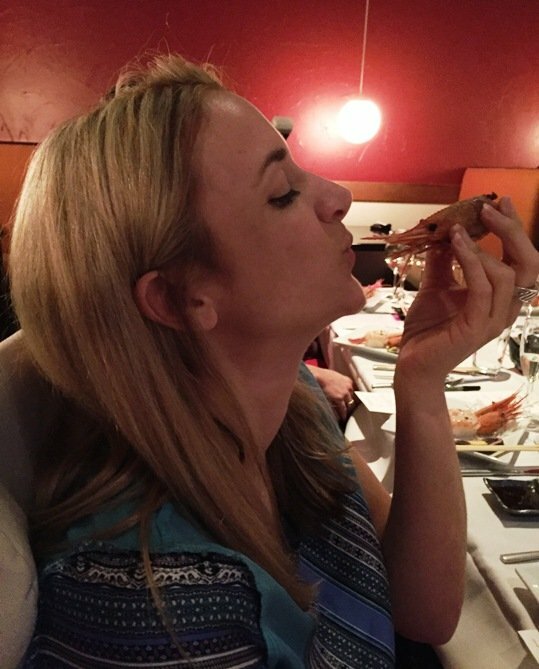 And I love the stiff chip contrasted against the soft, luscious fish. Nicely done here! We’re on our last savory course, charred lamb chops on grilled rice with wasabi dijonaisse. 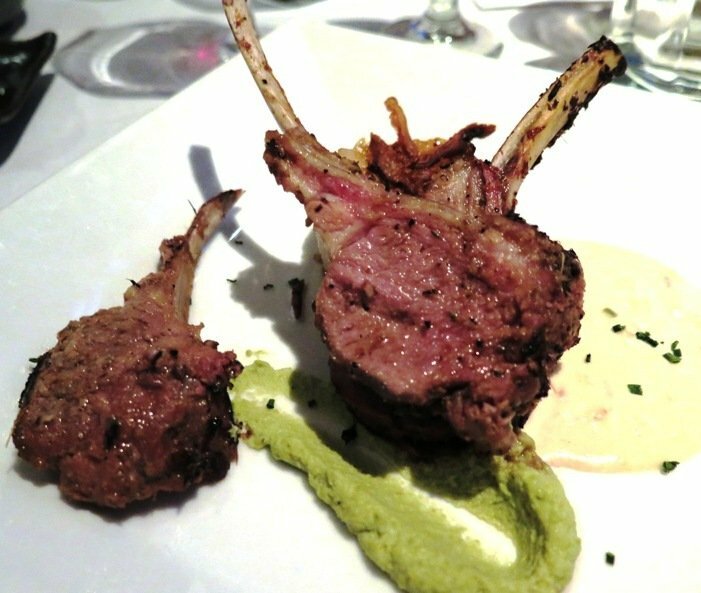 The lamb is nicely seared and I like the lightly spicy sauce it’s paired with. And after all the lighter courses it’s great to get a bit of reddish meat to amp up the meal a bit. And finally dessert! A yuzu (citrus) cheesecake with a sweet, chewy sesame crisp perched atop. 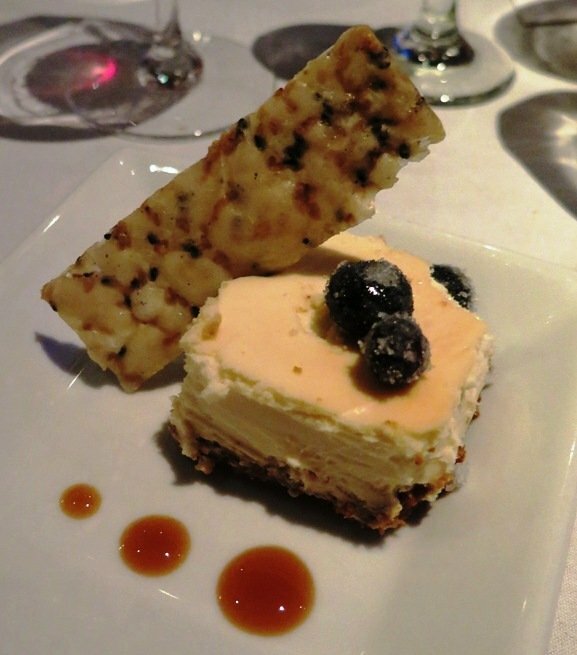 Good mouth-feel here with the lusciousness of the cheesecake contrasted against the crisp, chewy tuile. A fine ending to a wonderful meal here at Mura! As the meal and evening ends, Gina and I mark off some of our favorite wines and sake for purchase and we are off. The whole Wine vs. Sake crowd heads out full of great food, vino and sake. 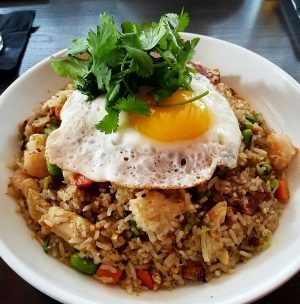 It was one of the best special dinners I’ve had in the Triangle and a wonderful surprise for me. 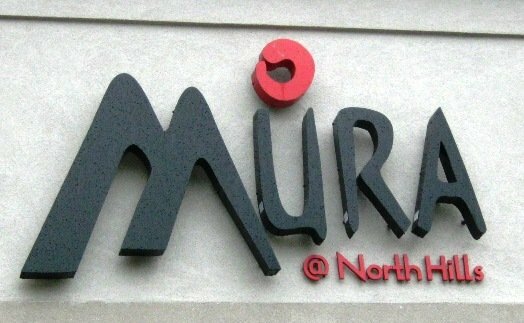 Between the great beverages and well presented dishes, Mura’s Wine vs. 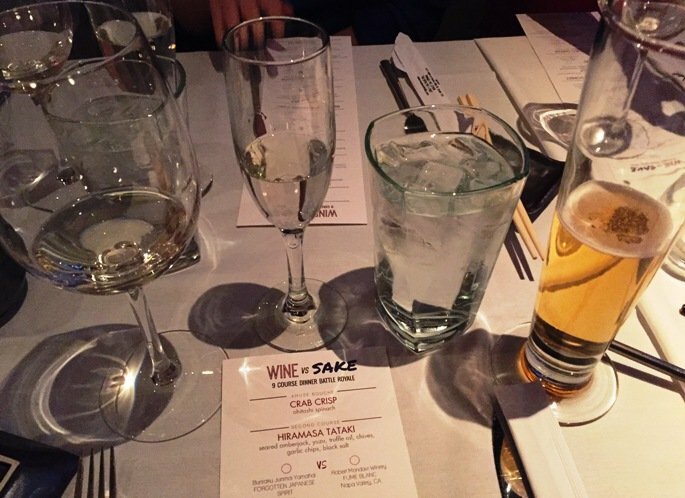 Sake dinner was an incredible value. And while I’m not sure when they will run this dinner again, there are plenty of other good ones to check out on the Eschelon Experience website. But if Mura runs Wine vs. Sake Part III, you can be sure I’ll be there again, kampai!